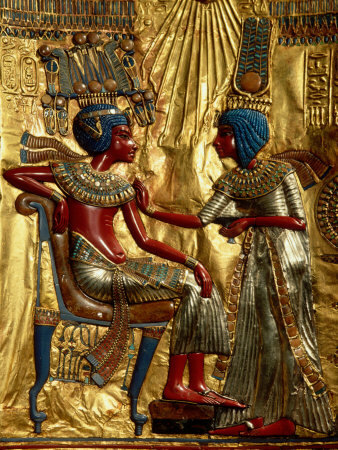 The ancient Egyptians filled their treasuries with gold any way they could come by it. And, no single element has tantalized and tormented the human imagination more than the shimmering metal known by the chemical symbol Au. But, why does the word “gold” designate what it does? The story of gold is as rich and complex as the metal itself. Held securely in national vaults as a reserve asset, gold has an irrefutable logic; released from the tombs of pharaohs and emperors alike, gold also has an undeniable magic. People moved mountains to find it. Armies conquered faraway countries to control it. For thousands of years the desire to possess gold has driven people to extremes, fueling wars and conquests, girding empires and currencies, leveling mountains and forests. But, Gold is not vital to human existence; it has, in fact, relatively few practical uses. Yet its chief virtues—its unusual density and malleability along with its imperishable shine—have made it one of the world’s most coveted commodities, a transcendent symbol of beauty, wealth, and immortality. Wars have been fought for it; love has been declared with it. Ancient Egyptian hieroglyphs portray gold as the brilliance of the sun; modern astronomers use mirrors coated with gold to capture images of the heavens. From pharaohs (who insisted on being buried in what they called the “flesh of the gods”) to the forty-niners (whose mad rush for the mother lode built the American West) to the financiers (who, following Sir Isaac Newton’s advice, made it the bedrock of the global economy): Nearly every society through the ages has invested gold with an almost mythological power. First, gold is money. It always has been. Gold has universal appeal and acceptability. If you were to send off to central casting for the perfect substance to serve as money, gold is what you’d get. What we call money today is not money at all. It’s just a rash experiment in credit expansion that has spun totally out of control. Which should make us question whether there is a connection between Human Freedom and A Gold Redeemable Money? At first glance it would seem that money belongs to the world of economics and human freedom to the political sphere. But when you recall that one of the first moves by Lenin, Mussolini and Hitler was to outlaw individual ownership of gold, you begin to sense that there may be some connection between money, redeemable in gold, and the rare prize known as human liberty. The invention of money allowed an extraordinary increase in commercial activity by liberating us from a direct barter system. By ancient times, gold and silver coins had become the money of choice because they were better than any other medium at maintaining their rate of exchange into goods and services, thereby favoring neither buyer nor seller. Considered as the official standard for money systems; we have the great mathematician, Sir Isaac Newton, to thank. Newton taught the world to attribute movement and motion to inherent properties embedded within the objects that move. Lightning falls, he argued, because of processes that can be measured and explained. A natural event is explained by the nature of the objects involved in the event. Change, movement and motion became subjects for a new philosophy of observation and recording, and no longer belonged to the realm of religious institutions, clerics and priests. Mass, weight and size — not Zeus — explain the natural order. That is, if a scientist could understand that an object is influenced by other objects and that inherent mass affects gravitational phenomena, then that would explain why an apple falls or why planets orbit. Newton was helping us to step away from medieval darkness and into scientific enlightenment. Science, not superstition, was the basis for a new kind of rational thought. And that takes us back to gold. Gold constitutes only about 5 parts per billion of the earth’s crust. It is also difficult, dangerous and expensive to extract. Gold doesn’t tarnish or decay. Gold doesn’t take up much space. All the gold mined in human history amounts to about 130 thousand metric tons, an amount which would only fill about a 100 foot cube if gathered in one place. You can stretch it, pound it thin, and divide it into multiple tiny amounts. And, most importantly, Gold can only be produced in limited quantities, currently at a peak rate of about 2,500 metric tons, or roughly 2%, each year. No matter what wars or social programs urgently need funding. But, for all of its allure, gold’s human and environmental toll has never been so steep. Part of the challenge, as well as the fascination, is that there is so little of it. In all of history, only 161,000 tons of gold have been mined, barely enough to fill two Olympic-size swimming pools. More than half of that has been extracted in the past 50 years. Now the world’s richest deposits are fast being depleted, and new discoveries are rare. This gold is temporarily and theoretically partial security for our paper currency. But in reality it is not. Here somebody might like to interrupt and point out that we are not now on the gold standard. That is true, internationally, but not domestically. Even though there is a lot of gold buried down at Fort Knox, that gold is not subject to demand by American citizens. paper money systems have always wound up with collapse and economic chaos. As the years pass, the price of gold will go up and we will pass along our understanding of gold to our children. The next generation will inherit from us a passion for gold and meaninglessness (despite the meaning we assign). Human life is easily identified with trivialities. The worth of a body is easily reduced to its ability to obtain more pliable metal for the rest of us. Humankind’s feverish attachment to gold shouldn’t have survived the modern world. Our parents have not recovered from their parent’s attachment to gold, and we likewise share in their affections. Gold grips the world. Few cultures still believe that gold can give eternal life, and every country in the world—the United States was last, in 1971—has done away with the gold standard, which John Maynard Keynes famously derided as “a barbarous relic.” But gold’s luster not only endures; fueled by global uncertainty, it grows stronger. There is no more important challenge facing us than this issue. Unless you are willing to surrender your children and your country to galloping inflation, war and slavery, then this cause demands your support. If human liberty is to survive in America, we must win the battle to restore honest money. This entry was posted in Uncategorized and tagged American citizens, ancient egypt, Business and Politics, consciousness, depression, enlightenment, environment, Fort Knox, health, humanity, Invest in Gold, Isaac Newton, life, live, Maynard Keynes, Money, nature, philosophy, Politics, President Obama, society, United States, universal, Zues. Bookmark the permalink. 4 Responses to Go For The Gold!